Why we need to be part of a tribe. 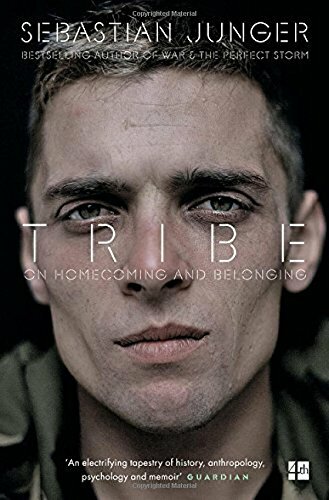 Tribe: On Homecoming And Belonging is a book by Sebastian Junger (Amazon) on how people are becoming more depressed and disconnected in safe and affluent societies. It’s much more than that. It’s about longing to be part of something bigger than ourselves and despite living safer, healthier and wealthier than ever, people are feeling that something is missing on a deep human level. What started as an article Junger wrote for Vanity Fair in 2015 titled, How PTSD Became a Problem Far Beyond the Battlefield, has become a short and interesting book on the growing societal problem of belonging. It asks thought-provoking questions like why the more affluent and safe we become the more cases of depression and suicide are on the rise? And why do mental health issues deteriorate during times of struggle, war and natural disasters? Tribe covers the paradoxes of feeling alive with purpose. How some soldiers who saw combat prefer to be still at war; how hardship can sometimes turn out to be a blessing and how disasters are sometimes remembered more fondly than something like a wedding. Junger tells the story of his youth and how growing up in an affluent suburb made him yearn for something exciting to happen. It never did so decides to hitchhike across America to put himself in situations of uncertainty. A poignant moment is when a dishevelled looking man walked half a mile to give the young Junger the remaining food he had to ensure he could eat while travelling alone. The man had made him a part of his ‘tribe’ and became a moment, Junger says, that he thought about not only for the rest of the trip but for the rest of his life. Tribe: On Homecoming and Belonging shows that humans have an ingrained need to belong in tribes. One of the reasons humans have been so successful over the years is their ability to work together. To form tribes and work for the common good of the group. It’s how we created nations, ideologies, survived catastrophes and so on. In the book, Sapiens: A Brief History of Humankind, author Yuval Noah Harari says the unification of humankind is why humans have been so successful. By forming tribes we could survive hurricanes and fend off lions that, otherwise, alone we may have not. For hundreds of thousands of years humans formed tribes that were classless and without hierarchy where authority was earned not seized. This form of tribalism, Junger says, brought meaning and coherence to people when times were hard and coming together for the collective good was necessary. He references modern day America and how the English settlers at war with the Native Americans would often leave the ranks of the English Americans and join a native tribe. The stark contrast between the industrial and class-based English system alongside classless and non-hierarchical Native American tribe was too much of a temptation for some settlers. Many English Americans went to live with the natives for good or until forced to return by the British Army. Junger also makes the point that it never happened in reverse and Native Americans never felt compelled to join the settlers. Societies become stronger and more cohesive during times of man-made and natural disasters. Junger cites how New Orleans during and after Hurricane Katrina experienced a significant decline in crime. Most of the looting reported at the time was people looking for food. During the Blitz in WWII Londoners should their grit and determination to ‘keep calm and carry on’ and would trudge to work the next day following a nighttime bombing raid by the German Luftwaffe. On an evening they would huddle together in their thousands while sheltering in nearby Tube stations. The London Blitz had a surprising reversal effect on mental health. Indeed, Junger references a study by sociologist, Emile Durkheim, who found that the positive effects of war on mental health weren’t limited to just the English. France, Germany, Spain, Algeria, Lebanon and Northern Ireland all had a decline in mental health when war was close to home. The study also found that residents in the cities that were more peaceful and less affected suffered greater mental health issues that those in the cities who saw the most war. A further study by the University of Chicago had similar results when researchers analysed mental health of citizens during natural disasters. In each case they found that humans reinforced social bonds and devoted their energies toward the good of the community. Again, like war, mental health issues declined. When people are engaged in a cause for the common good their lives have more moral purpose whereas our safe and modern society encourages purpose to be individualistic and outwardly driven. There has never been a greater time to be alive than now. But this safety and ease of living (for most of us) eliminates events where people have to demonstrate bravery and togetherness for the common good. Junger makes the case that this is the reason why when soldiers return from war they often struggle to settle back into civilian life. Contrary to the assumption they are suffering from PTSD and reliving the horrors they experienced in war. Soldiers develop comradery due to the danger they are in while at war. They depend on one another and therefore the bonds they form are perhaps greater than that of a family bond. This was found with soldiers war after war, country after country, century after century. When they return to civilian life they suffer profound feelings of alienation and begin to miss the war and their tribe. Indeed, according to the book, the most traumatic experience a soldier can go through is witnessing the death of his buddy. They don’t miss the danger and bloodshed but miss the unity of the tribe. Modern society has almost eradicated the tribe. People long to be a part of something. To be part of a cause which they believe in and work alongside other people to achieve it. The book makes a good case saying that we have almost eradicated any tribal groups. In my own personal experience, growing up in Co Durham where every generation before mine were all miners. About 85 percent of the men in my village and all the surrounding villages all worked down the mine. There was a solidarity which was particularly prevalent during the miners’ strike of 1984/85. As a small child I remember it fondly and one of the best years of my youth. When the mines closed the tribe began to break and the community was never the same. The community spirit lives on, however, and compared to London where there is very little of it (excluding times of crisis) it is positively a love-in. These days people find their tribe in their work but a career is no substitution. People work to earn money and/or to advance their careers. It’s more a selfish endeavour as opposed to working toward some long-term common goal. Technology also gives the illusion that we are closer than we are also. Mobile communication and social media are the platforms where we like and comment but this is not real. Research after research has shown that people feel more alone than ever in the digital age. I came across it via Joe Rogan who interviewed Junger recently which you can find below.